My palette is experience, but not trained. So please bear with this weak review. I found this bottle in Beltramo’s, for a nifty fifty bucks. The bottle is definitely cool, with the label going around the bottle with a rainbow trout pattern. It was marked Batch Two, also a coolness factor. What else can I say about this, a great name, a great bottle, a low numbered batch; I just wish the whiskey tasted better for me. The whiskey is dry, and starts off crisp. However, it has a nasty kick in the sinus a second, or so, after passing the lips. To compare to others, that first second reminds me an Irish whiskey, like Bushmills, and that kick like bourbon that comes in a plastic bottle (think Ten High). Palettes vary, and maybe just this hatch didn’t match mine. I may try batch five or ten. If you know me, I’ll be happy to give you a taste of mine. Don’t hurry, it will be around for a while. 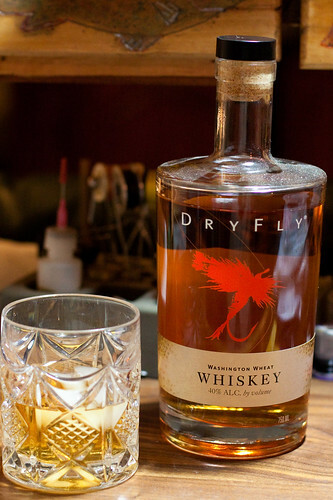 Dry Fly Whiskey definitely doesn’t displace Gentleman Jack. Tonight, I served Dry Fly to a friend who is a Scotch connoisseur. He enjoyed Dry Fly, as did his wife (she is not a whiskey drinker, nor does she drink whisky). So, tastes do vary, and you may enjoy Dry Fly. But if you drop $50 for a bottle and don’t like it, don’t blame me. Thank GOD I got sober in ’94…I don’t know what apple martinis taste like either…. Is it a Rye or Scotch? It’s a wheat whiskey, which I think makes it like a Rye. Man! I have to expand my horizons. I am not much of a drinker but I love the bottle design. The only time I drink is if I go camping and fishing and at guitar jams, although I never drink and fish, just doesn’t mix well. I have friends I play guitar with every couple of weeks and they all know how much I love fishing, especially fly fishing, and they talk about fishing and how they have to get out this year but in the 10 or 12 years we have been jamming I don’t think any of them have actually gone fishing.